Toby Jones, Iain Sinclair and Andrew Kötting (dressed as a Straw Bear), made an eighty mile walk from Epping Forest to Helpston in Northamptonshire, following in the footsteps of the poet John Clare. Clare's delirious march is the catalyst for the project. A great English pilgrimage and a self-enacted novel in the tradition of Pilgrim's Progress. 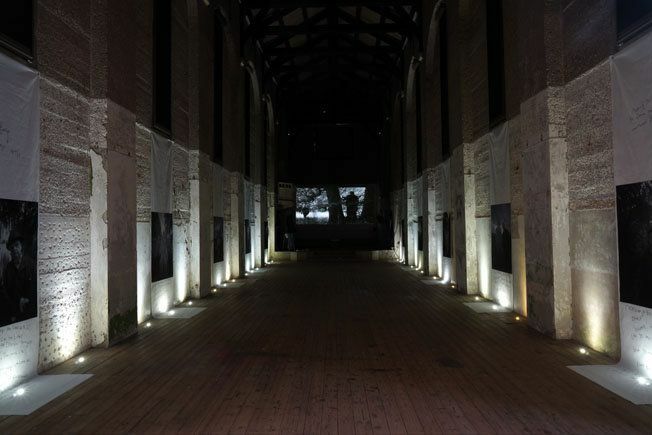 The walk was documented using pinhole photography and video and has now been edited to form the backdrop of the installation. The artists Nick Gordon Smith, Anonymous Bosch, Philippe Ciompi and Jem Finer as well as the singer Macgillivray and the musician David Aylward have all collaborated in support of the exhibition as well as Alan Moore and Kötting's daughter Eden who has contributed paintings and text in the guise of Dorothy from The Wizard of Oz. A feature film will be released in the new year through Soda Pictures. In 2000 Iain Sinclair set out to recreate Clare's walk away from madness. He wanted to understand his bond with the poet and escape the gravity of his London obsessions. Accompanied on this journey by his wife Anna (who shares a connection with Clare), the artist Brian Catling and magus Alan Moore, Sinclair's quest for Clare becomes an investigation into madness, sanity and the nature of the poet's muse. And this is echoed throughout the installation. His book Edge of the Orison will be made available throughout the exhibition. Brilliant . . . amusing, alarming and poignant. An elegy for an already lost English landscape. Magnificent and urgent. Robert Macfarlane, Times Literary Supplement. A sensitive, beautifully rendered portrait . . . a feast, a riddle, a slowly unravelling conundrum . . . a love-letter to British Romanticism. The Independent. Sinclair walks every inch of his wonderful novels and psychogeographies, pacing out huge word-courses like an architect laying out a city on an empty plain. J. G. Ballard, The Observer.